41 inches. Estimated 22 pounds. A friend and I chose to spend an evening chasing Yellow Perch a couple nights ago on Lake Bemidji. The Perch fishing can be really good this time of year and it had been a while since I’ve been out around Bemidji so I was pretty excited. The fishing started out slow with any fish being caught being quite small. Some time a little after 4pm I marked a nice fish 5 feet under the ice in 24 fow. I reeled my 1/32 ounce jig tipped with a waxworm up to the mark expecting to hook into one of the Cisco’s that frequent this area. The fish wasted no time biting and upon hookset I knew it was a big fish. The fish took out a bit of drag and was thrashing around quite a bit. I was thinking “sweet, REALLY big Cisco!” Then came an explosive run followed by extreme heaviness. Ok, Pike, not a Cisco. I could barely make any ground on the fish using a noodle rod and 3 pound test. To be honest I wasn’t expecting to land the fish at all, which I think helped keep me calm a bit. Some 15 minutes of back and forth went by before I finally caught a glimpse of her. She made a few more runs before we were ready to try to land her. The fish had gotten her self wrapped up in the line a bit so she wasn’t coming up face first and was stuck at the bottom of the hole, and with 30+ inches of ice to deal with that made things really tough. After some clever ingenuity involving a broom handle we finally were able to get her head up the hole a bit. My fishing partner reacted quickly and reached nearly shoulder deep into the water, and the fight was over. This Pike was hooked right in the very tip of the snout. If it had taken my jig any deeper at all, it would have been a much shorter and less fruitful battle. She stretched the tape to 41 inches and was one of the fattest Pike I’ve seen. After a quick photo session she was sent home all full of piss and vinegar. Northern Pike are the species that got me into fishing when I was 7 years old and I’ve dreamt of catching one this size since then. This wasn’t exactly how I expected it to go down but I can’t complain! Let me be the first to say congratulations! WgaW a beautiful fish! I am extremely jelous of this catch and happen to believe that I will be for some time! How you got that massive pike is just testimony of how you're never going to expect those catches that will be with you forever. Great job man! Killer fish! 3 lb test and 30 inches of ice...incredible! Awesome story man. Even cooler fish. A true backyard catch! What a fish. That's a great ice fishing story to tell for decades to come. Wow! Nice job man! That is one beauty. So happy you finally got one like that. And the way in which you got it is just ridiculous. Stuff like this makes fishing awesome. So does lots of other stuff, but stuff like this is really something else. It's amazing that you were able to land that on 3 lb line. Crazy freaking catch. Y If it would have been 2 lb mono you would have lost it for sure! Glad the broom handle gambit worked out so well for you - that's an insane story! Reminds me of when Jeremy Wade spent hundreds of hours chasing Musky, gave up and went jigging for perch and hooked a monster on ultralight tackle and landed it. That said, I think it's more miraculous and skillful that you landed this thing! Big pike will bite the smallest of lures. That's no accident. Very nice looking pike man. That is so awesome! I'm also surprised the ice edge at the bottom of the hole didn't slice your line. Holy cow roughfish29 - beautiful fish, congratulations. 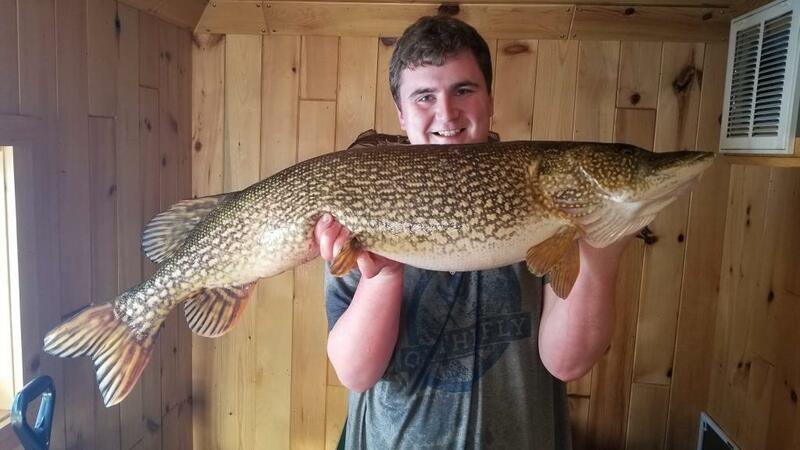 The Northern Pike is an incredible fish...especially when they get ridiculously big. I dream of some day hauling in a fifty incher that is 30 years old..alas I have yet to even catch a forty incher. Supreme chunk bag there...landing that thing must have been silly, well done. Probably older, that thing is a well-fed-tank. Outside of the great catch; I'm more impressed by the great story you have now collected. I mean catching a monster pike is pretty awesome in and of itself; but catching one while jigging for panfish through almost 3 feet of ice on 3 lb test...DAMN! I wouldn't have even thought this was possible. You'll be telling that story for the rest of your life.